I grew up in an eastern Canadian town called Truro, in Nova Scotia. I'm the sixth of seven kids born and raised on a dairy farm in the country. My family has had a huge spiritual influence in my life, due in part to a tragedy that happened early on. When I was three years old, my father was killed in a car accident, leaving us with a farm to run. I've seen first hand how suffering and brokenness can unite people to literally lean on God for strength. Even though I've been angry at God, and doubted whether or not he could exist at all, he is the only father I've ever known, and I've felt his presence in my life since I was really young. Music and spirituality were always connected in my family. I grew up in the church singing in choirs and groups, but it wasn't until high school that I got more serious about it. I auditioned for a school play in grade ten because I had a crush on a girl in my class who was into music and drama. Somehow I landed the lead role opposite this girl. I was really excited, but as soon as we started rehearsing, I realized what I had gotten myself into- I even had to sing a solo! It was the scariest thing I had ever done. I can remember sitting backstage before my song and thinking, "I'm such an idiot, if I ever get through this I'll never do anything like this again." Well, I never did get the girl in the end, but I fell in love with singing instead. During my first year of college, music was being affirmed in my life more and more as something to pursue. I was writing songs, but I was afraid to play them for people. I was eighteen and so far away from home. I felt like a really small fish in a huge ocean I was unaware had even existed until that point. Soon my friends dragged me to a coffeehouse on campus and basically told me to get over myself and play my songs for people. I remember being so scared up there and at one point during a song that I was playing on my keyboard, a fuse blew in the building and my keyboard lost power as I was singing. I was so embarrassed and thought I had totally made a fool of myself. After I was done, I opened my eyes and the room was full of people who were worshiping God with the music. I had never thought about leading worship before that night, but for months after, people came up to me and told me how they had been moved and that God had used my songs to bless them. The next year I transferred to Prairie Bible College in Alberta to study music. It was a great place because there were so many young and creative musicians with big dreams. In the spring of that year, we started a worship night called mnw (Monday Night Worship). It started with a conversation a group had about our hunger to not only know about God, but to begin a journey of actually knowing Him. We started out with about 20 people coming out to participate. We didn't know exactly what it was that we wanted to see happen, we just knew we wanted to see something happen and worship God with our music. Soon there were hundreds of kids showing up every week longing to experience God in a fresh way. 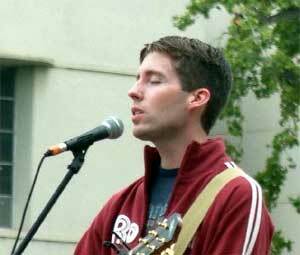 I graduated from college in the spring of 1998. mnw had grown to the point where we were getting a lot of requests to play at other colleges and church worship services. In April 1999, we hit the road for a tour that would end up lasting an entire year, but we really didn't expect it to amount to much more than a short term, post-college ministry tour. God certainly had other plans. It wasn't long before we were receiving letters and emails from record companies in Nashville. In one month 5 major Christian labels contacted us. I ended up signing a solo deal with Reunion Records in September 2000 with the members of mnw choosing to have the freedom to be in my band without any strings attached. My new album, Imagerical, is born out of the community we shared as mnw. All the songs are expressions of worship to God from our experiences together as a group of young people whose faith was becoming real for the first time. As I was recording the songs, I felt that. This album is not about me. True worship involves the community, trust, and shared experiences we find ourselves a part of. I want to take that with me. I hope when people hear this record, they sense that this music is inclusive. It's not only about listening to it, but rather being a part of it. To enter into the spirit of daily giving glory to God and exalting the name of Jesus with our lives. "Imagerical" (im-a-'jer-i-cal) (adj.) is a word a friend and I created and defined as "of or pertaining to the mysterious or the unknown. Involving imagery." When it came time to write lyrics for some music we wrote in the studio, we knew we wanted the verses to be darker in contrast with the chorus, which is pretty triumphant. One of us described the vibe we were going for as "Imagerical," basically meaning we needed to have mystery and images in the lyric. I wrote down the word and every time we got stumped we'd come back to it. It re-inspired us every time we read it. "New Beginning" describes God speaking to His people saying that though they have continued to do evil and turned away from Him, He will not punish them forever. God promises to revive and bring healing to a people that deserve anything but. Seeing all the pain in the world and how messed up we all are, to know that one day there will be a new beginning where the whole world will see the glory of God, is powerful. It moved me so much to know that there is hope like that. "Sanity" is the story of my life, and I think a lot of other people will relate as well. We all run in circles each day, never finding fulfillment in all the things we think will satisfy us. It's so easy to become numb, but when the love of Christ reaches you, it's like a flood of pure water awakening you to reality. To live a life of worship, we need to be awakened daily to the life that is in the Spirit. "I Wanna See You" is one of my favorite songs that I've ever written because I feel that it came from an honest place inside. I've had a taste of God's peace and victory in my life, but the truth is I'm still confused and fighting with my own sin, and I haven't experienced spiritual freedom in it's fullness yet. Some people seem to think that because a person leads worship or is involved in ministry, they must be some sort of spiritual guru, and have it all together. In my case, I never set out to be a worship leader. I don't have a polished or professional angle. I'm just a kid with a lot of rough edges, whose been incredibly affected by meeting with Jesus in worship. I feel like a wayward soul searching for truth and meaning. I don't want religion and I don't want easy answers because I've tried all that stuff and it's left me unsatisfied. God is calling all of us to revolutionary change. It's time to count the cost of what that means in our lives. As a generation trying to find meaning, we're discovering that true purpose and calling does exist, but it requires giving our whole lives to it no matter what that will ask of us. It's not something that comes easy, but it is possible. Jesus paid a high price on the cross, defeating sin in order to make it possible. It's been five years since I started this journey. The exciting thing is that it's only just beginning.